As the name suggests, reactive maintenance (also called emergency or breakdown maintenance) is unplanned and involves restoring equipment when it fails by replacing or repairing faulty parts. The cost of reactive maintenance is high due to the unplanned production downtime, damaged machinery, overtime, and callout fees caused by the uncertain timing and nature of failures. There is room for reactive maintenance in your broader maintenance strategy, but ideally it shouldn’t catch you unawares. You should reserve reactive maintenance for components that are inexpensive, easy to replace or whose failure does not cause collateral damage in the system. The one exception here are assets that are remote and therefore costly to perform regular preventive maintenance on—like satellites, for instance. Despite the clear downside of running a predominantly reactive maintenance strategy, approximately 55% of maintenance activities in the average facility in North America are still reactive. A big reason for this—as you may have guessed—is budget. Reactive maintenance requires less staff, less planning, and a lower initial investment so it’s a go-to in a lot of facilities, despite the disadvantages. But by tightening the purse strings, businesses are falling into a vicious cycle that leads leads to less planning, less oversight, and far less control over maintenance. Difficult to control budgets. Equipment failures can be unpredictable, which means that labour and spare parts may not be available when something goes down, and organizations can end up paying a premium for emergency parts shipping, travel time, and out of hours support. Shorter asset life expectancy. Reactive maintenance does not keep systems running in optimal condition. Over time these systems might not maximize their initial capital cost investment. Safety issues. Technicians tend to take more risks when maintenance work is reactive as they are under pressure to get systems running without delay. When work is scheduled, technicians have time to review the standard procedures and safety requirements to complete the job correctly. Time consuming. Reactive repairs tend to take longer because of the time it takes to diagnose the problem, time to pull parts from stores or emergency order, time to pull correct manuals and schematics etc. Inefficient use of resources. Technicians spend time running around looking for the correct manuals and schematics and ordering parts while trying to diagnose and fix the issue. Interferes with planned work. Emergency repairs are usually prioritized at the expense of planned work. Planned work may be pushed or cancelled completely. Collateral damage. A minor issue could quickly into a major system repair. Indirect costs. Unplanned downtime can lead to late orders if equipment cannot be returned to production in time. This can damage reputations and impact revenues. Repeat issues. Reactive maintenance does the bare minimum to get the system up and running again. If not repaired correctly, the issue could reoccur and cause more downtime. Higher energy costs. When equipment is not properly maintained, it uses more energy. Doing simple things like greasing moving parts or changing filters can reduce energy consumption by 15%. It’s impossible to avoid emergency repairs altogether, but if you choose to rely on reactive maintenance as your primary asset management strategy, then you need to ensure any failures have minimal impact on your business. You can reduce the impact of unplanned failures by running parallel production lines, stocking a full set of spare parts, documenting emergency procedures, training your staff on how to respond to emergency repairs, and giving them the tools and skills needed to complete any repairs. 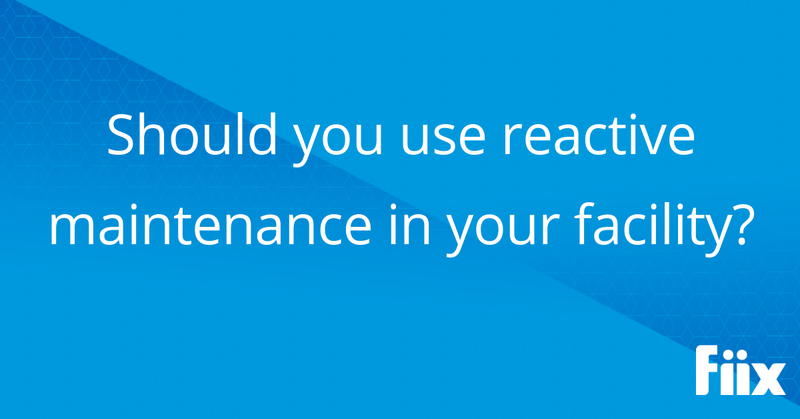 How often should you use reactive maintenance? The ideal maintenance strategy is an 80/20 ratio of planned to reactive maintenance and using a computerized maintenance management system (CMMS) can help you get there. It helps maintenance managers plan and execute preventive inspections and maintenance to minimize reactive repairs. Read our blog on 3 ways to get preventive maintenance under control for a good overview of using the 80/20 rule in your facility.